Everyone knows it’s crucial to be making more environmentally sound choices, and many of us are doing our best when it comes to buying food, clothes and running our homes, but what do you do when it comes to your wedding? Anselm Guise inherited his family home, Elmore Court, after founding Glade festival. With his ‘leave no trace’ background of running outdoor events it was a high priority to turn Elmore into a sustainable business model, and that’s exactly what he did when he opened up the doors for weddings and events in 2013. Our rammed earth, soundproof, eco ballroom The Gillyflower was the first and biggest of the sustainable choices we made and a real dream come true; built in 2013 from natural materials all sourced from our estate, it has a wild meadow growing in front and also on the roof, with flowers specifically planted to encourage pollinating insects and bees, which in turn help to pollinate the fruit orchards surrounding us. Our biomass boiler burns trees grown on our estate and provides carbon neutral heating and hot water for the main house, reception venue and The Coach house. The amount of carbon dioxide a biomass boiler produces is the same as the amount that was absorbed during the trees life so it’s 100% carbon neutral! Trees are grown on the Elmore estate for the fuel, so far we have planted 25 acres of new woodland since 2013! These wooded areas not only provide the raw material to heat the wedding venue but also create wildlife habitats and help us lower co2 in our atmosphere. High tech House: We use an advanced digital thermostat to help control heat loss from the house, this is remotely accessed so we can adjust temperatures to within 1 degree anytime! Most of the lights in the house are now LED and we use a local renewable energy company to supply our electricity. 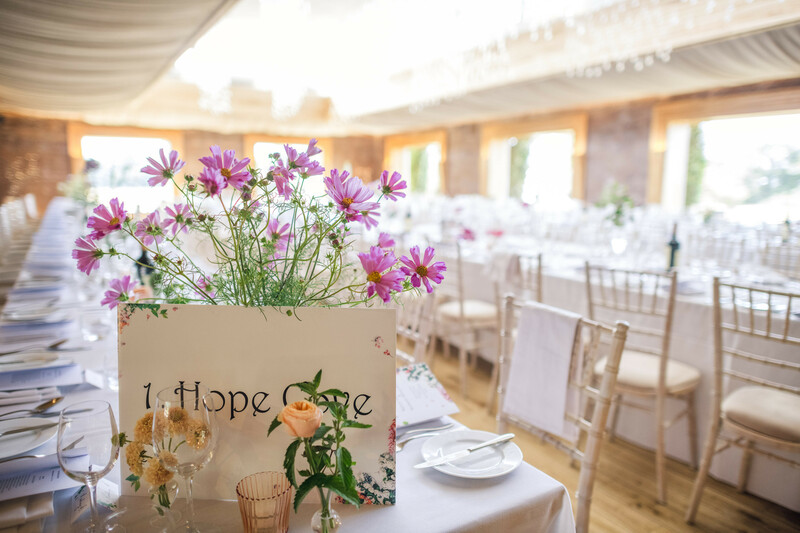 Sustainable wedding menus: Elmore uses locally sourced and sustainable food wherever possible, we are currently in the midst of planting a kitchen garden to grow much of the food onsite, as well as ramping up our use of produce from the local farms here. We will soon introduce bees to produce our own Elmore honey too. Plastic straws are no more. We do not use plastic straws at Elmore Court and have recently teamed up with Whole World Water, and now only provide water for events and guests in reusable glass bottles in order to cut down on plastic as much as possible. All our preferred suppliers do their bit to improve sustainability and reduce waste at weddings too, floristry is a big area for waste but the suppliers we love all choose locally sourced flowers as much as possible, or grow their own, many of our favourite wedding florists are also vetoing floral foam (which never fully biodegrades and also leaks harmful chemicals intothe environment) and instead are going back to old ways of styling flowers with moss and chicken wire. All wedding flowers that are not re-used by the couples or guests, or donated to local charities/ hospitals or churches are used to make compost to mulch the borders in the grounds. Ask your wedding suppliers for their green credentials! Opt for suppliers whose ethos echoes your own. Opt for organic, locally grown and British sourced flowers. Talk to your wedding florist about arrangements that don’t need floral foam to hold them together (this takes hundreds of years to breakdown), or ask them to use another method to create the same look; chicken wire, buckets and moss are all wonderful sustainable alternatives! Choose seasonal and locally sourced food for your wedding menu- the less air miles the better! If you’re going for glitter choose biodegradable glitter rather than plastic which ends up in our oceans. Recycled bottles make amazing vases for a rustic look. Opting for potted plants, herbs or bulbs instead of big cut floral displays can be planted after the wedding, doubling as a lovely lasting memory in your garden! Seed paper invites are a lovely touch…Guests can create their own little flower patch with your invite! A wedding is one of the biggest investments in your lifetime- use your money wisely! Boycott mass produced items and choose small businesses and local wedding suppliers for all aspects of your wedding including clothing, decor and food; It’s good for our economy and the planet too.